Whatever you are doing today and however you are feeling, I’m pretty sure that this wedding will make you smile. For a start, there are sunflowers by the bucketload, possibly the happiest flowers of all time. And if there’s ever a bride and groom that have beamed from ear to ear with infectious smiles for the whole of their wedding day, then it’s Jenna and Jeff. 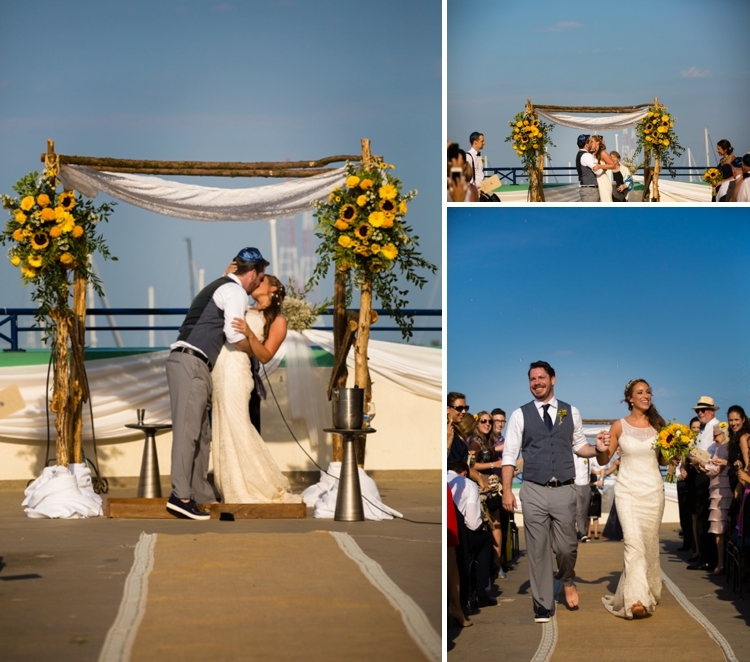 Jenna and Jeff (or J ² as they call themselves) toyed with the possibility of getting married on the beach, but for various reasons they didn’t, and instead, they brought the beach to their rooftop venue. 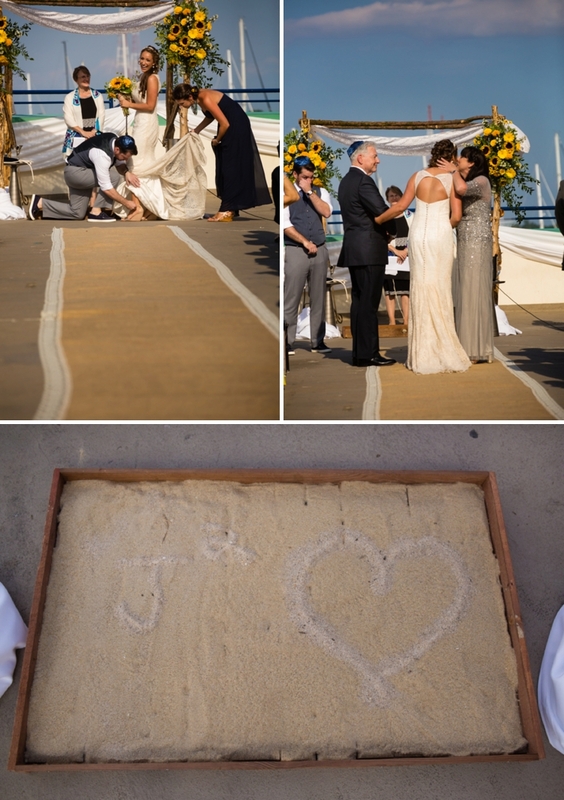 They had a barefoot-toes-in-the-sand wedding, as beneath the chuppah was a box full of sand with J ² etched into it. I absolutely love the fact that Jeff put one shoe on to smash the glass, and then he and his new wife walked back down the aisle barefoot…except for Jeff’s one shoe! Regular readers know what a fan I am of personalised details and I am in raptures over today’s chuppah which was hand-crafted by a family friend. 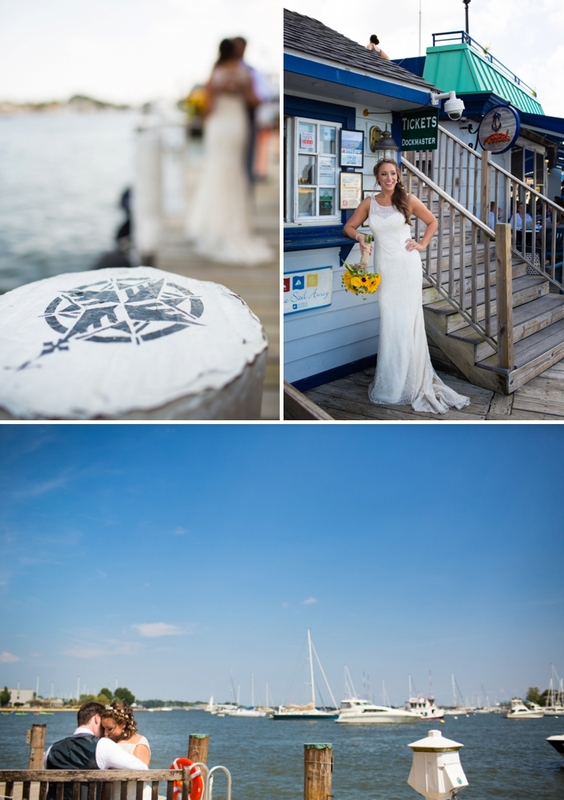 The pole structure was inscribed with Jenna and Jeff’s initials, as well as the initials of their parents, and their wedding date, and even an anchor to support their nautical theme. The fabric covering was Jenna’s grandmother’s lace table cloth. 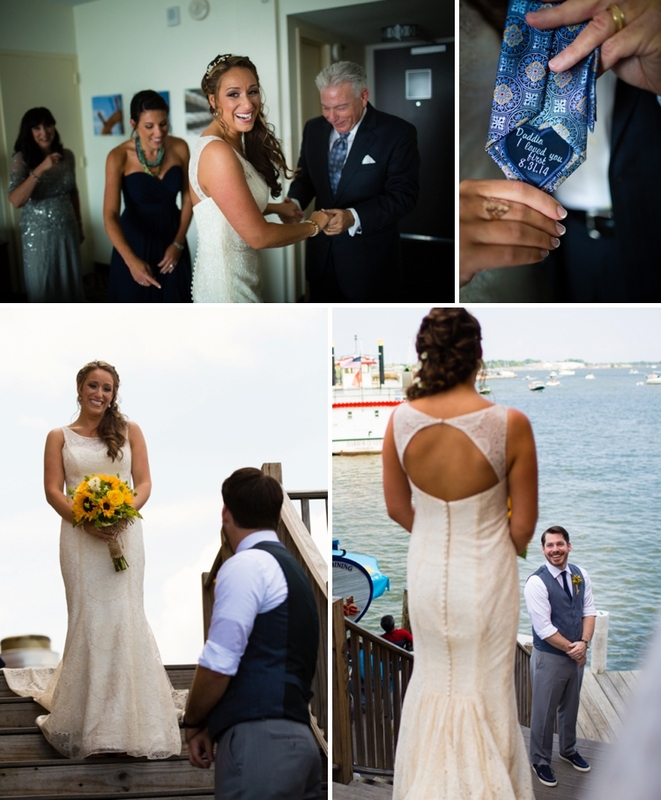 Being a nautical-themed W day, I must also mention that Jenna and Jeff literally tied a knot… a seafaring “fisherman’s love knot”! So let’s take a look. I’ve got the breathtaking images from Tiltawhirl Imagery, as well as the beautiful wedding film from MM Film Studio at the foot of the post. 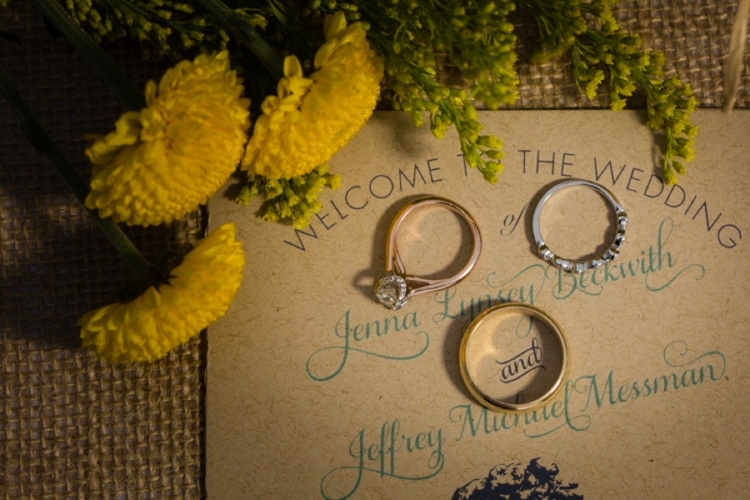 Jenna and Jeff have written their wedding report together. Ultimately, we decided to get married closer to DC to help accommodate certain guests that were essential to the weekend but would have had trouble travelling. It was also important to us to get married in a state that recognised marriage equality and neither North Carolina, Florida, or Jenna’s home state of Virginia did at the time. As residents of Maryland, and voters of the successful marriage equality bill, we thought that somewhere around Annapolis could work perfectly. After checking out only one other venue, we selected the Annapolis Marriott. 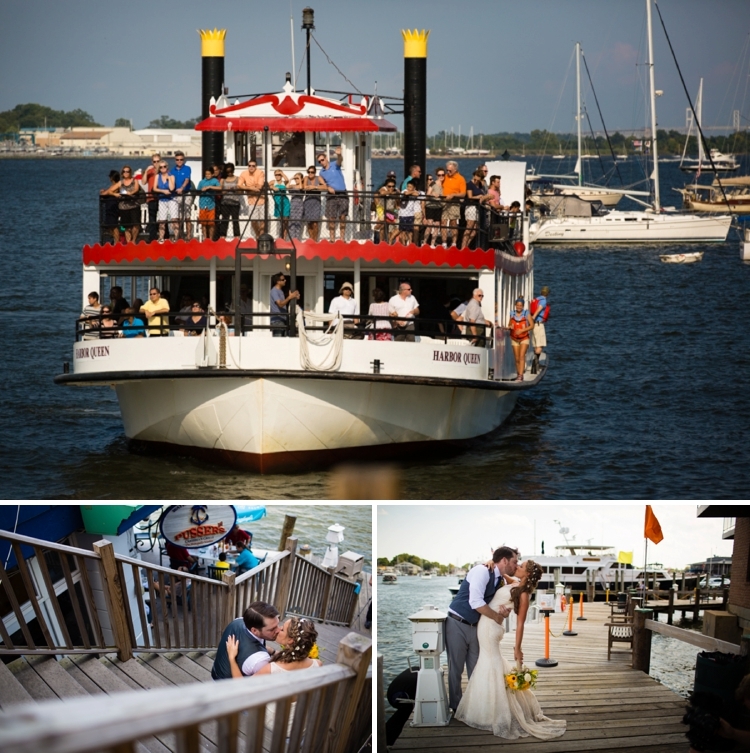 It allowed us to have both the ceremony and reception in the same spot, was right on the water, and allowed our guests to experience a unique city that many had never visited before. We did not have a particular theme per se, but navy blue incorporated both a nautical theme as well as our Penn State blue! 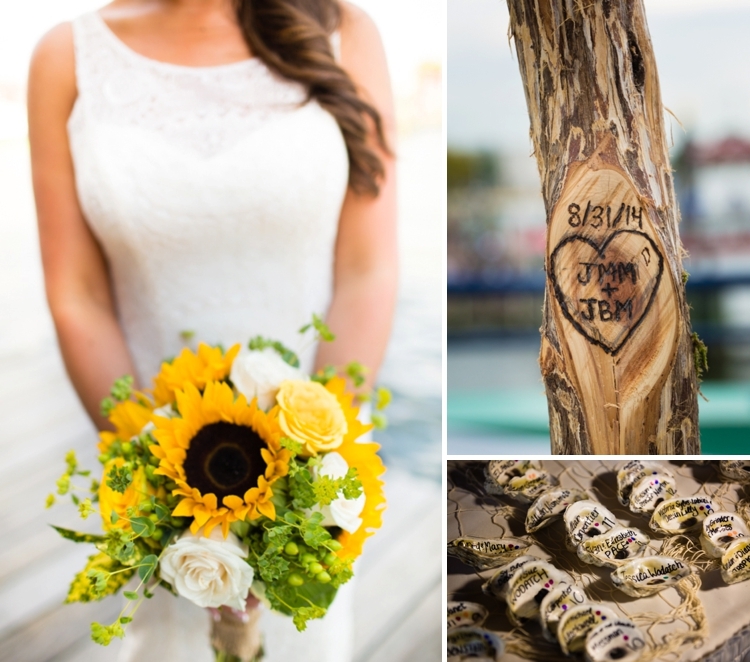 Being married in Annapolis, anchors and oysters (see the table cards — yes we ate all of those oysters) abounded as did sunflowers (Jenna’s favourite) for a summer feel. The vibe was a bit beachy, nautical, and natural. our save the dates became our wedding invitations! My dress was called ‘Eugenia’ and I found it at Adriennes. I wanted something boho and vintage yet classic, and most importantly, something comfortable that I could dance in! The cut and vintage lace on this couture dress immediately caught my eye. When it fit like a glove off of the rack and the owner offered it to me at a discount — I WAS SOLD! 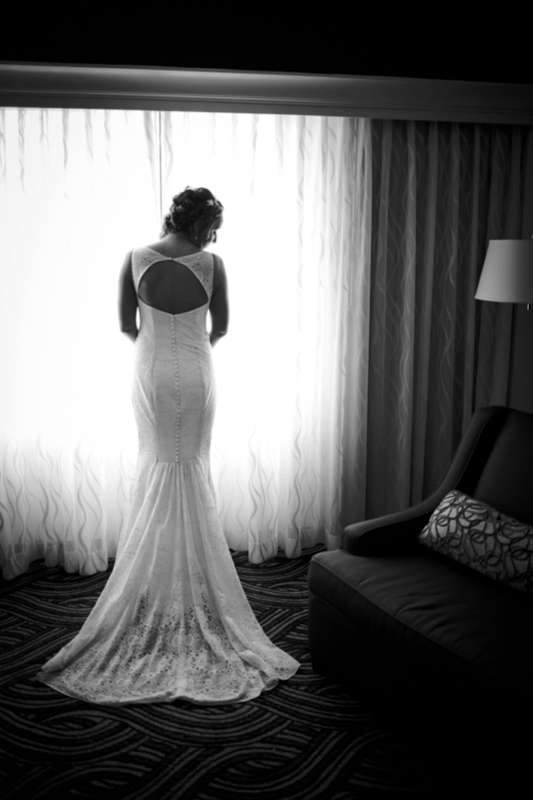 Jeff said that when he turned around at our first look that he couldn’t have imagined me in anything else. It was so perfect for me and fit my style and personality so well. 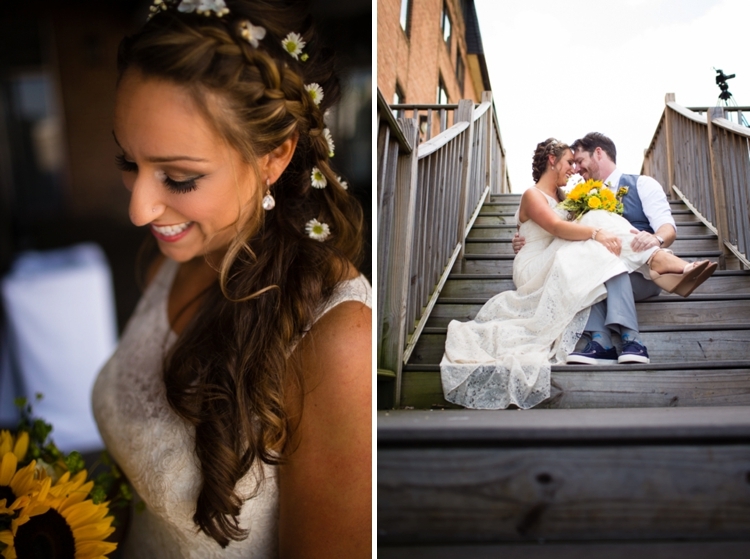 Flowers in Jenna’s hair and sunflower hair clips for the guests! Jeff would probably describe Jenna as hippie, Jenna would probably describe herself as boho beach glam. Regardless, you can see that a floral crown with additional flowers in the hair were a must! 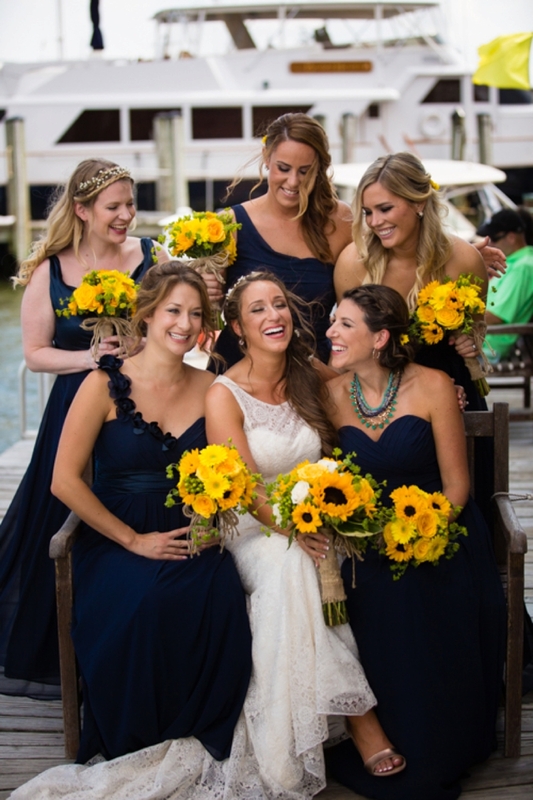 Not only did the bride and bridesmaids wear flowers in their hair, small sunflower hair clips were made available to all guests along with yarmulkes. The sign read, “If you wish, grab a flower for your hair or a yarmulke for your head. Then go grab a seat because soon we’ll be wed!” It brought Jenna so much joy to look out at the guests during the ceremony and reception and see little yellow flowers dancing on so many heads! Her friends and family are still wearing them! Jenna wore a rose gold (her engagement ring is also rose gold, her favourite) monogrammed ring (with her new initials) that was gifted to her as a bridal shower gift by her matron of honour, her big sister Jessica DeDomenico. Jenna waited over 2 months to wear the ring because she wanted it to be her “something new” on the wedding day! Jenna also wore a mother of pearl bracelet that her paternal grandparents gave to her mother. This “something borrowed” was symbolic for Jenna because it was a way to bring in her grandfather, who passed away last year. Jenna’s “something blue” was a Penn State garter belt that has been passed around, like the sisterhood of the travelling garter belt, among all of her Penn State best friends. 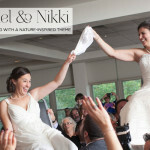 Jenna’s wedding was the garter belt’s 5th wedding, and in November it made it to it’s 6th and final wedding! The jury is still out on how the girls will “share” this momento! Jenna was not the kind of bride that had planned out her entire wedding as a little girl. In fact, when asked what she envisioned for her wedding, she would reply “All I want is to get married to my best friend, barefoot in the sand. 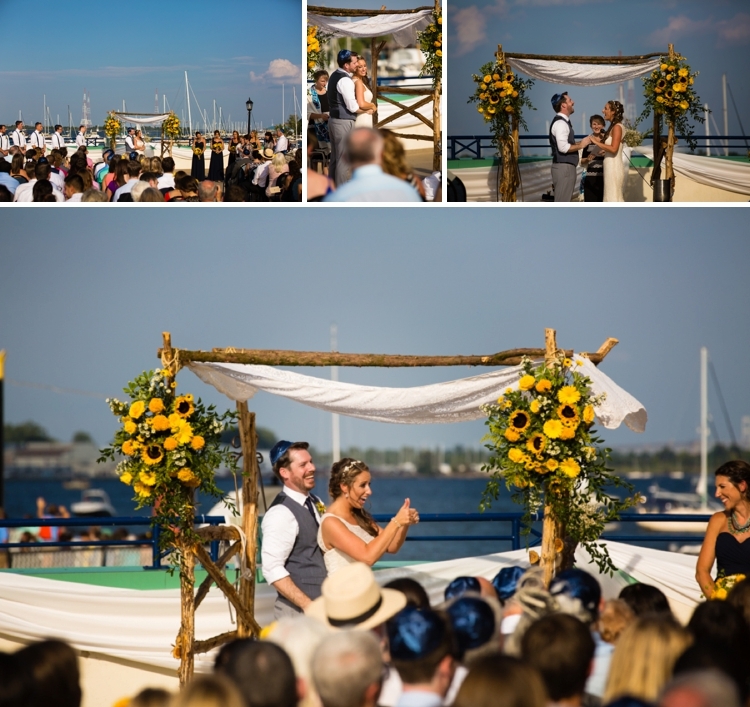 The rest is just a bonus.” Although the venue was waterfront, the ceremony was on a roof, not a beach! Jenna and Jeff decided that they could get creative here. They had a family friend construct a small cedar sandbox for them to stand in and they had friends bring in sand from the various places they have lived and vacationed over the years, and fulfilled Jenna’s vision of getting married barefoot in the sand (with her best friend right in the sandbox with her). When Jenna was not barefoot, she was wearing a pair of rose gold wedges (to match the rose gold theme). There are some great pictures of Jeff and her sister Jessica trying to remove her shoes before she stepped into the sandbox with Jeff. And there are great pictures of Jeff putting on one shoe just to break the glass, and then preceding down the aisle with one shoe on (Jenna was still barefoot). Jeff, the Groom: To go with our nautical touches, I did not want to wear a full suit nor have my groomsmen in one either. We went with white dress shirts (with the sleeves rolled up) and grey pants with blue boat shoes. I wore a blue vest and a long navy tie while my groomsmen wore braces with bow ties. We added a Maryland touch with grey socks with blue crabs on them for fun! Also, you can’t forget the navy yarmulkes. Since Jenna and I got married with our feet in sand, I walked down the aisle without socks and removed my shoes before the ceremony. Prior to the breaking of the glass, I only put one shoe back on to break the glass before heading back down the aisle. Some of my favorite pictures show me half-barefoot celebrating with my new wife! I had five bridesmaids. They wore navy blue Bill Levkoff dresses, all different styles. I gifted four of my bridesmaids a beautiful Stella & Dot bracelet and gifted my matron of honour an incredible Stella & Dot necklace to set her apart. 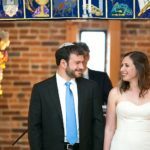 We wrote our own vows and had those vows translated into Hebrew and painted on to our ketubah. 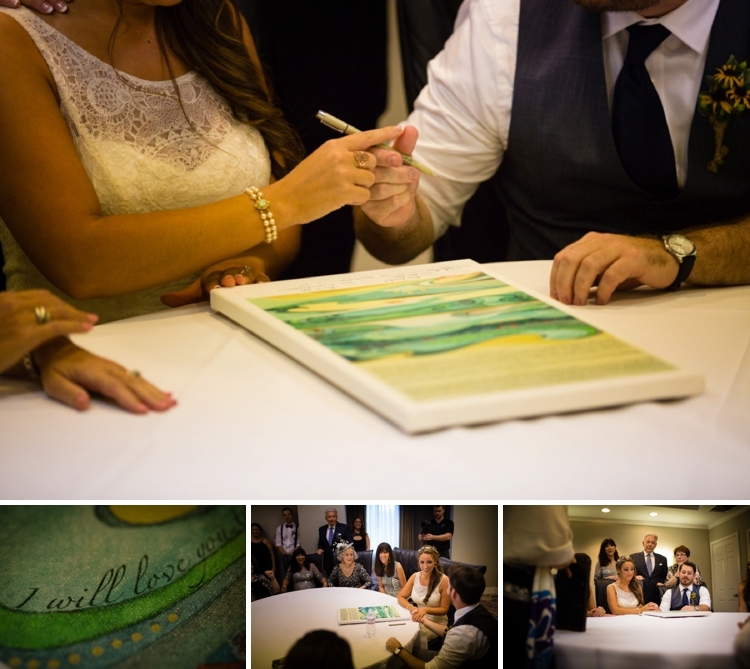 The ketubah, from Ketubah.com, featured our nautical theme and was commissioned by Jenna’s two aunts and witnesses. We later found out that the artist they commissioned for the ketubah also a member of Jenna’s family’s synagogue! Our chuppah was handmade by the same family friend who also made the sandbox.. It was made from cedar wood and carved with our initials, our wedding date, our parents initials, and things that we considered important to our relationship. 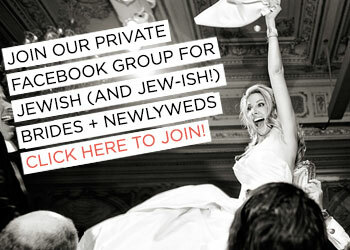 Along with the chuppah, we used Jenna’s grandmother’s lace tablecloth as our cover. Jeff’s wedding ring is his father’s, David Sr., who passed away in 1997. Jeff’s sister-in-law Bobbi sang “In My Life” by the Beatles and Jenna’s brother Jason accompanied her on guitar. This was special because it was the same song that Bobbi and Jeff’s brother David used as the processional to their wedding, and was a favourite of Jeff’s father. Our ceremony was very special and family oriented for us. Jenna’s sister Jessica was the Matron of Honor while Jeff’s brother David was the Best Man. The two of them shared the first cup of wine for the opening toast from the Kiddush cup (one Kiddish cup was Jenna’s father, Ed’s from his bar-mitzvah, the other was her grandfather’s — who recently passed away). Our nephews (Jessica’s three sons) were our ring bearers. We also had a reading from three of Jenna’s college friends — a reading that has been used in all of their weddings throughout the years. Another special aspect of the ceremony was the Rabbi. 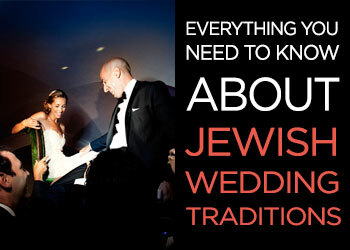 Rabbi Amy Schwartzman (Senior Rabbi at Temple Rodef Shalom) performed Jenna’s bat mitzvah as well 17 years before! The glass Jeff broke was a special glass that we will have made into a mezuzah. Lastly, we literally tied a knot! 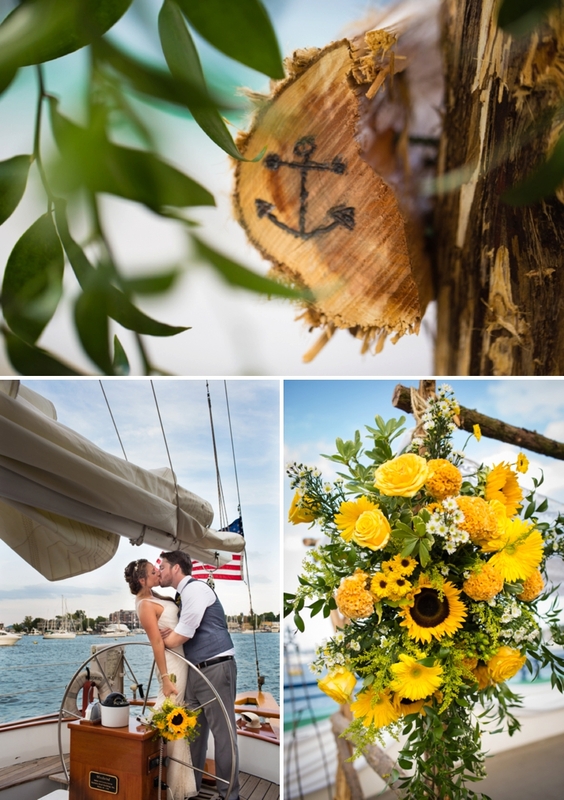 A nautical “fisherman’s love knot” — there are great pictures of this, too! The bridal party processed to You and Me by Dave Matthews Band. Jenna and her parents processed to All of Me by John Legend. The recessional was All You Need is Love performed by David Lynden Hall (the version from Love Actually). As we processed, the guests blew bubbles. It was picture perfect. We must acknowledge Jeff’s mother (Liz) for taking the lead on the absolutely gorgeous flowers that you see in these pictures! Initially, we weren’t too concerned with flowers and even contemplated not having any at all! Liz loves all things gardening and has such a great eye for flowers. “No flowers?” she asked. This was unacceptable. 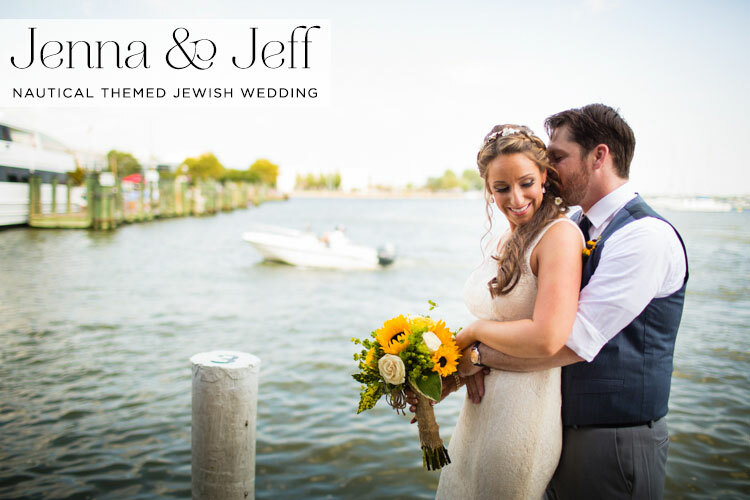 She asked Jenna and Jeff to give her some ideas, Jenna loves sunflowers and Jeff really liked the idea of Black-Eyed-Susans (Maryland state flower) as his boutonniere. 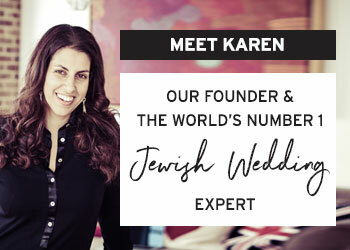 She enlisted the help of some of her generous friends to select and design the beautiful bouquets and chuppah arrangements. Some of the blooms were picked from Liz’s very own garden. 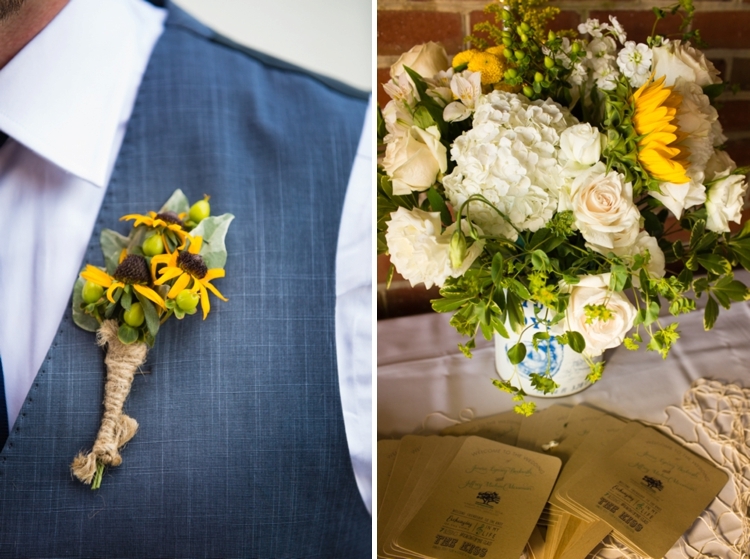 In looking back at the pictures, we realise how much brightness and joy the flowers added to our event. They were perfection, and we are incredibly grateful for the loving and creative work that went into making them part of our day. Iris (Jenna’s mother) and Liz (Jeff’s mother) worked on the centrepieces together. They would send us pictures of themselves baking cookies, drinking wine, and coming up with centrepiece ideas.. It was a fun project for them to work on together and the results were beautiful! Mason jars with Penn State ribbon, lanterns (borrowed from one of the bride’s best friends), candles, baby’s breath, and little chalk boards with table numbers on them. Also on the tables were pictures of Jenna and Jeff at the Outer Banks this past summer, wearing white, with numbers written in the sand for each table number. Some of these were quite candid and very cute! We used Tiltawhirl Imagery as our photographers. 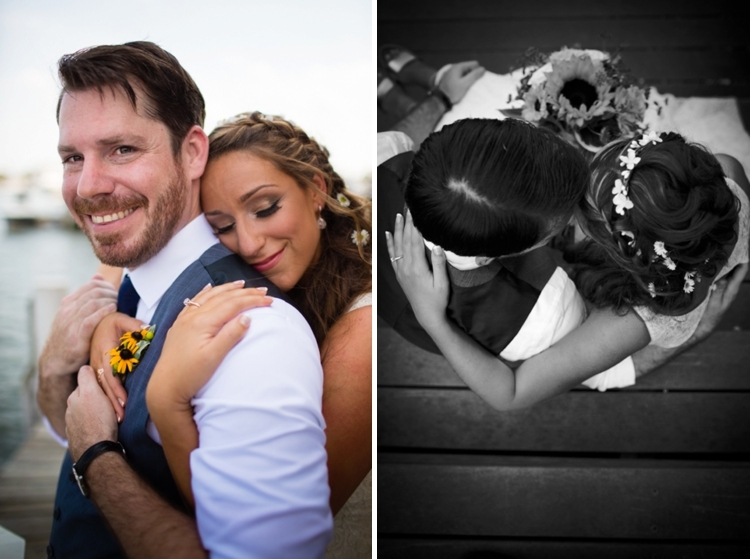 Rachel and Mark were phenomenal to work with for our wedding. 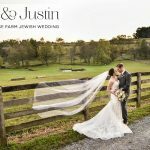 From the minute we were referred to them, they showed sincere enthusiasm for our wedding and made it a priority to learn as much about us as possible. 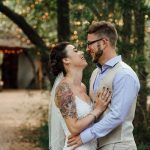 Throughout the planning process, Rachel and Mark kept in constant communication with us to ensure that all photos we wanted would be accounted for. On the day of the wedding, they were extremely proactive, organised and professional the entire time. Their work was impeccable and has garnered rave reviews from our family and friends. On top of that, the turnaround in which Rachel and Mark got us our initial proofs and final photos was the quickest I’ve ever seen! We used MM Film Studio for our videography. This pair is incredible. My husband and I found them relatively last minute and they could not have been easier to work with or more accommodating to our needs. Cake? Who needs a cake? 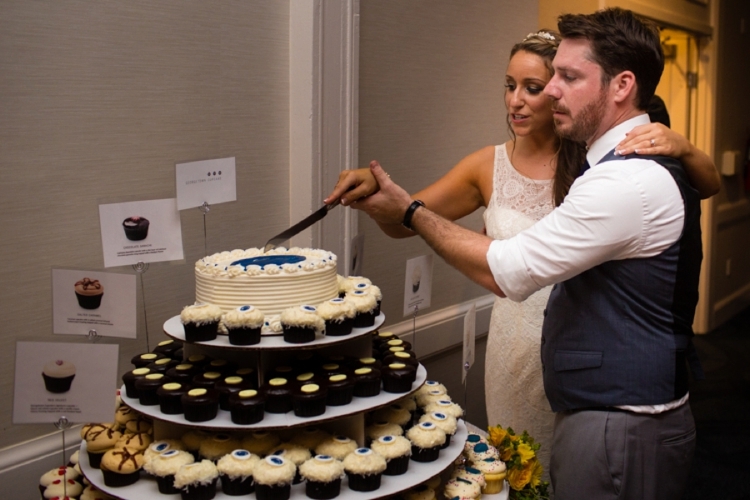 We actually catered with the famous and local Georgetown Cupcakes to get about 14 dozen cupcakes of different varieties for our out of town guests! The line for Georgetown Cupcakes is usually around the block, it was just a little shorter at our wedding! We were able to personalise the cupcakes in a variety of very cute ways, including a J2 (our nick name, we are both J’s) and the Penn State lion head logo. We got a small cake for our cupcake tower topper — a blue velvet (yes, Penn State blue) cake from a local bakery, The Main Ingredient. Red velvet is Jenna’s favourite! 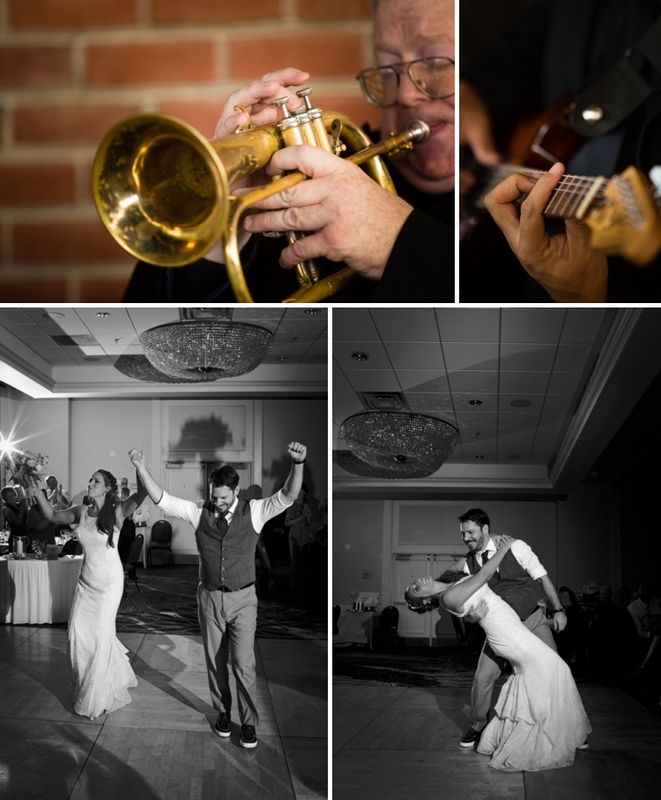 We knew that we wanted to have a band at our wedding. 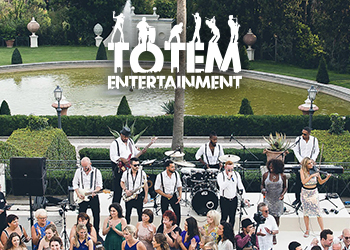 Initially, we looked into hiring the same band that Jeff’s best friend from high school (and groomsman) had at his wedding, but after some research they just seemed to not have the same vibe we remembered. After some more looking, we found an a DC based band named Amaretto. In a word, Amaretto was awesome. They’re a 12 piece band complete with a horn section. Needless to say, the dance floor was filled the entire night! Our first song was More Than Anyone by Gavin DeGraw (this has been our song for quite some time). 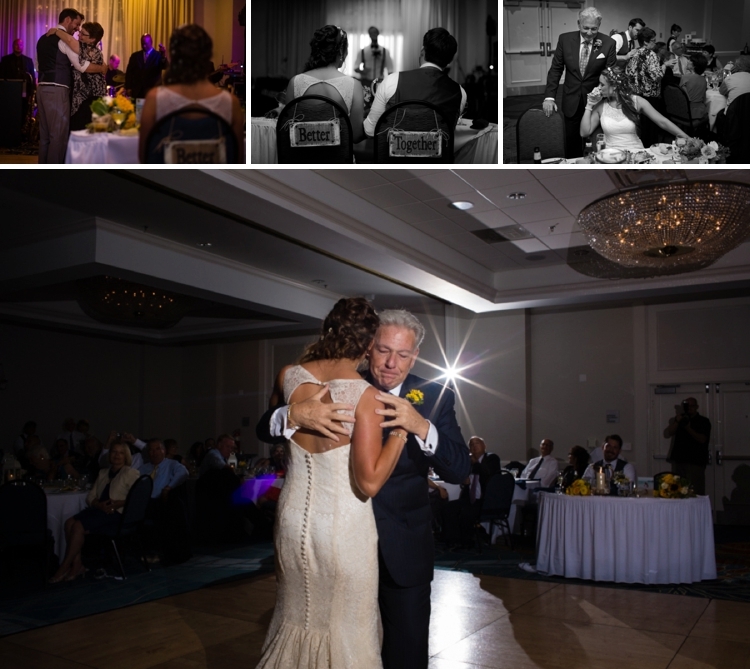 We secretly took dance lessons to choreograph our first dance and it paid off! We killed it and everyone was thoroughly impressed that Jeff didn’t have two left feet. In lieu of traditional favours,, we gave a gift to Lambda Legal in order to use our happy occasion to help others have the same opportunity. We acknowledged during their ceremony that the world is not whole and that the ability to commit love openly and publicly and to legally wed, is not a right bestowed to all people. With this gift, we hope to help to bring about change and legal rights for LGBTQ Americans. Our photographer asked us a few months before our wedding what the most important part of the day was. We said “That we are present in the moment and ENJOY IT, savouring the love and positive energy! I hope we have moments that we can just be still and connect with one another. It is our hope that our guests can feel our love and appreciation for one another and for everyone in attendance. They are all important people in our lives. On top of that, we hope people dance and have a blast!” That was thoroughly accomplished. We truly felt like we were able to be present in every moment of that day and weekend with one another and with our guests. Nothing felt rushed or stressed. It felt perfect. So pleased you loved it Allister! I took great pleasure in putting the blog post together Such a sunny, happy day! OMG you are SO PRETTY and you looked SO GOOD on your wedding day! I am not just saying that either! 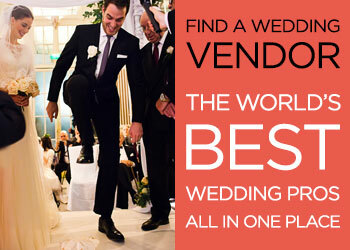 I would know, we see SO MANY BRIDES. We do a lot of bridal parties, especially people who want to get married at the resort across from our salon, or on the beach, as we are right on shore drive.You can see some of the wedding pics from weddings we’ve done. 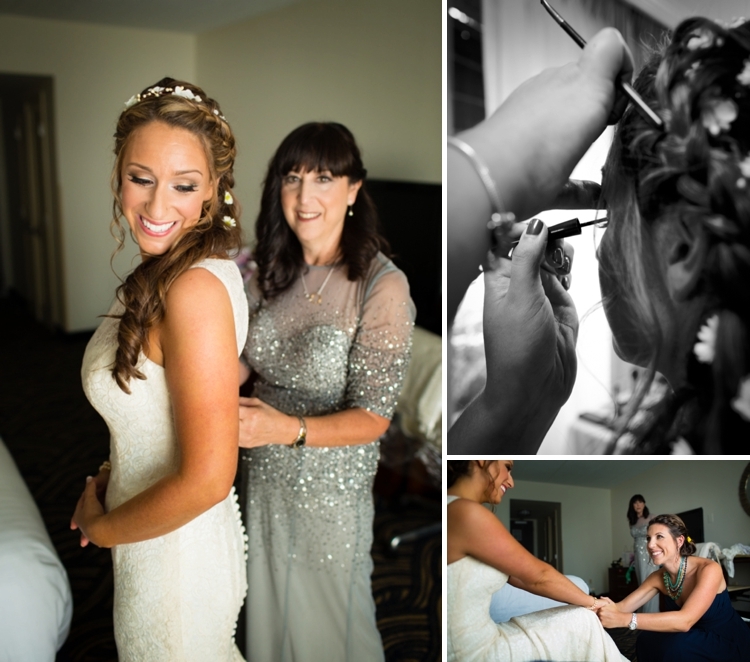 We help with hair and makeup usually and just do the entire bridal party all at once, it makes it way way fun for everyone! ShearblissVB. com check us out and see what you think, if you are ever in Virginia Beach again…we would love to have you! Your hair looks GORGEOUS! That is exactly how we would have done it and suggested! We also are super fans of the Balayage french coloring style, which seems to be more and more popular for weddings these days. 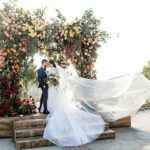 I suppose brides are seeing the style with A-list celebs and then wanting to do it themselves… really gives them the … “red carpet” look : ) Anyway, GORGEOUS wedding photos! I’m a fan!